Water saving technology to make a splash about. The Winning Line washing machine with intelligent ActiveWater technology uses the right amount of water for every load and never wasting a drop more. How do I remove the child lock? Currently have a key symbol flashing when I try to turn it – have pressed all buttons but nothing happens….. I have just found the same thing, if you hold down the start button it will remove the child lock, didn’t even know it had one, good to know for the future! Thank you thank you thank you!!!!! Was nearly crying when the washing machine wouldn’t go on this morning and kept flashing CL. Could not find anything in instructions. Have had such a stressful week and this nearly broke me!! Who knew it had a child lock! So relieved! I have just seen a comment on line I cannot get my Bosch Vario Perfect to work as it keeps flashing CL. It appears it is a childs lock how do I take this off?? Thank you so much I had the same problem. Phew! Thank you so much, so simple when you know how. Automatically thought it meant door not closed properly, who would have though child lock, certainly not me. Thank you again and now being able to get on with my many wash loads. Merry Christmas and Happy New Year. Thank you – have just had the same problem! went on line and found from Bosch web site that child lock the problem but told to look in manual fro solution which of course is not there! about to phone a repairer when found this site – thank you so very much! Me too but it is “CL” that flashes. You have saved me hours on the phone! Thank you for that. I too didn’t know there was a child lock but great to know and pass on. Thanks for the CL code advice – I turned the dial to 60 degrees and held down the start button and hey presto code cancelled and machine working again! was desperately hunting for information as to why my machine kept flashing cl, thank you Nixon for the info, it worked! How can I use the machine to just spin the clothes without extra rinsing? According to other forums you turn the dial to rinse/spin and dis-engage the “aqua plus” button and it spins only. I am trying to do a pre-wash only if possible??? I have a 40o C + prewash on my dial but wondered if I could do a prewash on its own. Thanks for that. Just what I needed to know too. Thank you too. Couldn’t find that advice anywhere in the instruction manual. You have helped a lot of people with your GENIUS way of just getting a spin without the wash! I’ve only had the flaming thing for more than 6 years and just assumed is was a dumb design. !!! I cannot find answers to these questions. Just turn on Aquasave button when on spin cycle. It won’t rinse then . Help, how do I disable the annoying alarm that sounds at the end of the wash programme and doesn’t stop until you switch off machine? Did you manage to disable the horrific bleeping sound at the end of a cycle. It’s really starting to annoy me now! I have just had the same problem. Did you get a Solution? I have the same problem but my 10 month old actually did it for me!!! It seems pressing and holding the start button put tons the child lock on as well and the repeat to take it off…. Thank god for kids hey!!! i have a Bosch vario perfect less than a year old, how do I deodorise as it has mold on the rubber ring and smells awful any suggestions would be welcome!! Doors to washing machines should ALWAYS be left open until fully dry. This prevents the mould from starting in the first place. As to getting rid of it, it just sounds like some hard work is needed. How can I get it to spin only – instead of rinse/spin. I don’t like this machine – can’t wait for it to go wrong beyond repair!!! Can’t start the washer – child lock is not on (as far as I can tell) – the start button keeps flashing and you can’t select any other buttons. Tried reclosing door, unplugging, usual things, just can’t get it going. This is the most frustrating washing machine- I’ve only ever got it working twice. Please please tell me how to stop the bloody awful alarm at end of programme, its driving us mad! Hi all!How to lock my bosh classixx/1400 express? I will have had my Vario Perfect for two years this coming May/June. I have noticed in the last few months that when spinning (on any cycle) it has become incredibly loud. Has anyone else noticed this with their Vario? The washing comes out perfectly it is just a lot louder than when I first purchased it (unbearable if you are in the kitchen where it is kept). It is still under guarantee as I purchased it from John Lewis but they said they will charge a call out if they find nothing wrong with it. Any comments would be appreciated – thank you. I cannot figure out how to get a quick wash on my Exxcel Varioperfect. I start the wash on ‘Mixed Load’, reduce the temp to 30 degrees and press Speed Perfect and then, even though it says the wash will take 48 mins, it somehow defaults into a much longer wash! How can I get the fastest cycle? Pleeeease help, its driving me mad because I have three sporty boys and mountains of laundry!!! Have to say I absolutely LOVE the bleeping sound when the wash has finished cos I find if I take the washed clothes out immediately it reduces my ironing load! The manual is useless and I have tried a lot (!) of combinations. All advice welcome and thank you in advance. Hi Margaret, did you ever solve the issue of increased cycle time fom mixed load wash? I have a new Varioperfect machine which adds an half an hour to the mixed load wash, which should take 48mins on speed or 1hour as normal. It seems to count down the wash cycle fine until 11 minutes remaining but when the cycle transitions from wash to rinse, the timer changes to 46 minutes remaining. Very frustrating when you have mountains of laundry to get through. Any thoughts greatly appreciated! Please can anyone tell me what the 40 and 60 degree programmes with an arrow next to them on the dial do? The manual is hopeless! Doesn’t mention these anywhere! Thanks! This is explained quite clearly on the supplementary sheet that gives an overview of the programmes. It says that in regard to the arrows, these programmes “are suitable for cleaning normally soiled cotton fabrics and are the most efficient with respect to combined energy and water consumption”. You have to select ‘Eco Perfect’ to initiate them. This also means that these programmes are very long in duration! Can you please let me know why my machine at all spin speeds makes a very loud noise and moves across the floor. The vibration from the drum is such that the whole machine moves. Have tried to level and stabilise the machine but still it moves when spinning. I have the same issue. Any help would be appreciated. Thanks. Did you remove the transport bolts before installing? My Bosch classics is getting stuck in the cycle and taking double the time to finish. it seems to be repeating the cycle.can anyone help please. Did you find a solution to this. My Bosch is driving me nuts with washing so long on a simple cycle of what should take 1hr approx. I use liquid fabric softener in the section next to the detergent in the drawer. When I close the drawer I can see all the softener immediately drip down the glass into the washing machine. It isn’t held there until the final rinse. Is this a design fault? I have the same problem, and its a new machine. I’m trying to solve this before i get an engineer out from the shop we bought it from. Judging by this forum, this machine is way too complicated! My Bosch varioPerfect is flashing CL on and off and no matter where I turn knob for whatever washing instruciton I give it it still flashes CL in the indicator area? Please what do I do? Machine is not one year old yet. CL mean Child lock – push button (play/pause) Start/Reload for approx. 5 seconds after the start/end of the programme. Please is there a spin only setting as I can’t find it. We’ve got brand new Bosch washing machine and it vibrates extremely – all cupboards & glasses, mugs, etc are shaking too; and its very, very noisy. It’s perfectly levelled, we even put an anti-vibration mat underneath. Any ideas what’s wrong or how we can fix this, as it’s unbearable and we have complaints from our neighbours as well (the lady upstairs said that everything in her kitchen is shaking too!). Shipping bolts are removed? During transport, the drum behind locked transport bolts. help ! what dose E18 mean? it keeps flashing half way though a cycle. Hello, E18 indicates a time out draining. Hi, I have the same problem with a upd code, did you ever figure out how to fix it? I am experiencing exactly the same problem and it is so annoying. I have tried with and without the Aqua Plus button on or off and it makes no difference. Please can someone help with this very irritating fault? How do I adjust the spin speed? All the washing is still soaking wet!!!! Button on the bottom left is spin speed selector, You can use it. I have just received my verioperfect but was rather surprised at the long washing time (1:30) for the usual easy care 30 degree programme when my previous “classics” machine was only 42 minutes. I try to change the time using the “ready in” button but this only allows changes in hours. How can I alter the minutes and get back to my 42 minutes. I have tried to remove the pump cover on my varioperfect. Does it require a strong pull after screwing it loose. Afraid to put much more effort int removing unscrewed cap. I haven’t had any problems with my Varioperfect until now. I am doing a 40 degree wash and when it finishes the wash light is flashing and the washing is really wet. Keep having to do a spin at the end. Does anyone know how to fix this please? See if it is not clogged filter machine. It looks as if the spin not flow water. My Bosch Varioperfect has worked fine for a few years but now during the rinse cycle the water is pushed through the detergent and pre-wash compartments rather than the fabric conditioner compartment. Therefore no conditioner is getting into the wash. I have cleaned the drawer and the water inlet holes in the roof of the compartment but it has made no difference. Any ideas? Hi, I would need to ship my washing machine. Anyone know how to lock the drum prior to shipping? Hi, before shipping you should screw carriage bolts into the drum. They’re prepared holes on the back of the machine. Pls help me..i accidentally choose the empty program and i cannot open the door anymore..inside is empty..what to do..
Why does my softener draw stay full of water after washing finishes. I have to empty it before next wash. Thank you. It usually causes a clogged drain in the washing machine, get out of the drawer and clean. Same happening to me. My wash endsup getting three washes. Have to do rinse and spin wash. Sorry I bought it. E18 keeps coming up and I have to turn the machine off and restart wash. This can happen 2 to 3 times. Have also got new Bosch Wendy. Turn dial to rinse/spin. Select spin speed and Turn off Aqua plus – just tried it myself as all my washing was still wet! All now ready for the tumbler! Am now trying to work out how to put child lock on as my grandson is a nightmare and keeps pressing the buttons!!!!! Please can anybody tell me which programme allows a 1400 spin? Hi, I have the Bosch Varioperfect washing machine and when it gets to 1 min the timer increases by 10 mins, then when it finally gets back to 1 min again, it never stops the program. Hi, with this problem I have encountered, helped me repairman it is the fault of electronics. 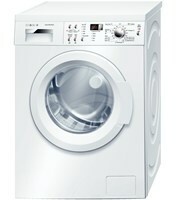 I have a new washing maschine and was very hard to understand this day more details about. I want to try to spin for 1 minute but is starts working, but does not rotate washing drum. And we have the same problem with vibration and noise when spin on other programm. Please help because is important for me. Is there a code to open the door on washing machine whilst error f21 is on ,I am aware that I need to replace the bushes but cant open the door ? My washing will not finish standard cycle (Aqua Plus 1200 spin), displaying E 18, could anyone help to resolve this problem please. On first ocassion I managed to open machine and remove section of load and re set programme with out success. Hi All’ purchased a Bosch “vario perfect” washing machine a couple of days ago, only to find that each time it is used on the 90 degree wash it leaks from the draw and runs down the front of the machine, asked shop about it, who said “dont use it on 90! !” usefull eh! It seems to be the effect of steam from the wash coming out of a poorly designed drawer, they want £95 to come out if they find no fault, anybody else had/having the same problem? Hi,what light do you mean display? A flashing wash light indicaters too much foam is detected – either reduce the ammount of detergent to the level reccomended by the manufacturer, ensure you are using an automatic washing machine detergent or possibly which happened to me putting stain remover in with the detergent causes it. Worse case the foam can start coming out the draw ! Got this new vario perfect Bosch washer, 5 times its left the washing soaking wet and hasn’t spun, keep putting it back on a wash. Only, for same thing to happen again, any answers. (might be faulty) ?? Hi, this is strange. Check whether the spin is prohibited. When Ive used the mixed load setting on my varioperfect recently somewhere through the cycle the aquaplus setting comes on automatically. It’s in the garage so unless I stand over it I can’t see when this is happening. But it only happens on this setting. Very frustrating as everything left sopping went and then need to run the rinse and spin setting. Any ideas? On the wool cycle, water enters the drum and then the machine stops working but doesn’t display any error codes. What am I doing wrong? Also when I have got it working in the past it does not spin properly but the clothes are literally dripping wet. Any thoughts please. I have followed manual instructions to stop beeping noise on my vario perfect Bosch washing machine but it doesn’t work , any ideas ? Today after 8 months we found out how to spin without rinsing. The machine is fine, it is the manual that is hopeless. It is a general manual, very intent on safety, not specific to this machine. There is a small sheet with very poor notes and errors about this machine. Bosch should at once produce useful machine-specific manuals as they used to do. My Bosch Vario Washing Machine (WAQ283S0GB) door has become loose. It appears a special tool may be required to tighten the fixings on the plastic inner trim pieces of the door close to the hinge. Any advice you may be able to offer to fix the problem would be welcome. I have just purchased a BOSCH WAQ284D0GB, can anyone tell me how to do a cotton type wash for about an hour or less using a 1400 spin speed, the manuel is driving me nuts. Thanks. Has anybody had problems with the Bosch vario-perfect smelling. I’ve run off the water through the small pipe near the filter and checked the filter. I even tilted it to makw sure. I’ve also run it empty at 90 degrees. And checked under and behind the machine. But the smell returns. Any suggestions please? Make one washing cycle: clean water with one liter of vinegar and the smell will be gone. Hi, E18 indicates a time out draining. I have a Bosch Vario washing machine. I put my washing on a 59 minute wash at 40 degrees but by the time it gets to between 25 -30mins to go it changes and goes back up to 45 mins. I does this with nearly every wash I do. no matter what temperature or cycle. Hi I have a Bosch vario, when cycle is just about finished it reverts back to the start again. I have checked all filters got service man check it and he replaced two boards but problem still exists . Any ideas ??? Feeling frustrated. Please advise what the symbol for cold water washing is on the VarioPerfect. I had thought it was the star symbol, but now think that is super hot 90C. Reading the comments posted for the past two years it seems if it is a common problem that the machine runs for hours when only suppose to perform a 30-60 min cycle. I have the same frustrating problem but could not get any solution from the comments above. Considering to get rid of it and rather buying something else. Anyone know how to disable the bleeping noise on the Bosch varioperfect WAW….GB? Had it less than a week and want to take the axe to it! ? Having dyed a load of garments, I happily sloshed bleach into detergent drawer AND the drum of my Bosch Varioperfect! Foam everywhere and the wash light flashing madly, indicating too much detergent. Anyone know if its possible to shut off existing program in mid cycle and just drain the machine? The fault is totally mine; the machine has been brilliant….so far! Hi Li – I am having the same problem as you. Mine was stopped yesterday and nothing I do seems to stop all the spin lights flashing. The stop/start button is also not illuminated. I have left it unplugged overnight thinking it might rectify itself but no joy. Have you managed to get your machine working again? Have had a Bosch varioperfect for three years now and have always been very disappointed wit the quality of the wash-the whites are just not as clean as they should be or have been with cheaper machines in the past. Any ideas? I’m very thankful to this forum for clearing up a problem we had with our Bosch Vario Perfect washing machine we had the CL problem but it’s sorted out now.. I don’t like the soap draw being full of water after every wash i hate keep having to empty the draw surely that’s not right why don’t it empty properly. I also have a nasty smell from the washing machine when working my husband has pulled the machine out checked the pipes are clean checked all the filters nothing there where is this smell coming from..
My washing machine is showing an E18 Error message and we have to restart it. What is causing this and how do I fix it. Hi Nambita, did you ever get a reply to your query? Ours has just done the same thing, suspect it might be the drain pump. Just encountered the ‘CL’ problem. Thank you to all those people who told us how to resolve the problem and to inform us what CL actually stands for. Now I would like to know, ‘How the heck did I put it on in the first place?’ I’d already done two loads this morning…. First time using VarioPerfect, driven mad!! Why does the machine keep stopping and flashing yes, then no and beeping – from the manual it looks like I’ve pressed pause to try and add more laundry – but I’m pressing nothing! I don’t know if there’s something wrong with the sensor buttons on the front, I haven’t been able to select or de-select any of the settings – and when I press the start button to try and resume the wash, sometimes nothing happens, sometimes after the 3rd of 4th attempt it re-starts – starting to wonder if it will ever get to the end of the cycle!! Any suggestions please? Can the machine ( Bosch VarioPerfect be programed to spin only once having completed a wash.? Complete rubbish. After 8 months the drum bearings went, but at least a new drum was fitted under warranty. 6 months after that the weights on the drum came lose, again fixed under warranty. Now at just under 3 years old it looks like the drain pump has packed in, although the manual is completely useless so who knows. My first and last Bosch appliance, overpriced rubbish. My machine is jumping, banging and travelling in the spin cycle it then refuses to empty the water so the washing comes out soaked . very frustrating . Is anyone else having this problem ? I have used the spin/rinse setting to Spin only by disengaging the Aqua plus button. On a Spin speed of 400rpm it took 13 minutes of spinning. I am wanting to use this setting for dedicates so surely this can’t be right? I have never had a washing machine that didn’t Spin only. Any suggestions welcome. How do you get a Vario Perfect to return to the program it was just on when either knocked by accident or on purpose by a determined toddler (who knows how to turn the child lock off ) and keeps on interfering with the dial? This has happened frustratingly often and as soon as you turn the dial it resets the program and you have to start again… Why do Bosch make the Childlock so difficult for adults ( I find it takes at least 20 seconds ) but somehow easy for little fingers to operate… You can also knock the Aqua Plus button midcycle which means the laundry comes out the machine dripping wet, I wish I could disable this feature as I can’t imagine any circumstance when this would be useful to me. This happened to us- luckily I sorted it before my partner took to it with a hammer! I just pushed 2 buttons at the same time and held them until it stopped. Seemed to work. Good luck. following 6 tries at rinse and spin and pushing aqua plus switch to turn off that feature leaving a 1200 spin signal. We have achieved an approximately 80rpm. contents remain soaking wet. I think this is a fault. when I use the super quick wash the water doesnt heat up even though i turn the dial to 40 degrees! does anyone have this problem? i have a bosch varioperfect washing machine. the start buton keeps flashing but theres nothing on the screen. Any ideas? My variomatic is displaying various fault codes and will not start a wash. I replaced the door switch as this was the first code but it made no difference. Could it be the pcb? Bosch VarioPerfect Series 4 – finished program say END on led but door wont open as the small red key is lit…. Just got my Bosch Varioperfect washing machine and on the rinse cycle the draining pipe overflowed onto the floor as it couldn’t take the rush of water from the machine. I didn’t have this problem with my previous Bosch. Any ideas please? When turning on, there is a slight delay before the lights indicating time appeares. Then when I press the start button it just beeps twice. Nothing more. Ane ideas? I cannot get the door open on my Variomatic Serie 4. I have tried pressing and holding the start button as advised above, but this does not work. Has anyone found an alternative solution? if you seen E to the screenonitor and keep msking no8se , and it won’t be open , what i have to do ? i try to on off and on.but not working. my machine will not complete a spin cycle. it gets to the last 3 minutes then goes to zero without the last fast speed cycle being activated. Does anyone know what i can do to rectify this? I have an Exxcel Varioperfect washing machine. Is there any way to do a prewash on its own on the cotton programme so I can prewash the dog towels, then add other towels to the load? My machine wont work…. CL keeps appearing on the display screen…I cant find my manual to know what to do. Please help!!!! We have a bosch varioperfect washing machine. Just recently when trying to set the cotton wash to 90 degrees the machine comes up with a 4 hour delayed wash sign. I have been washing cottons in this way for a while. Why has the machine just started to play up? I have just purchased a new Bosch various perfect when it comes spinning mode the machine bvibrates and shakes. Due to bad weather am unable to contact suppliers. Any ideas. My washing machine fills with water even when it’s off, leak into drum seems to be coming from top, any ideas? I put conditioner in the appropriate drawer but it never disappears . Hi can anybody pleeeeze tell me how to do a pre wash on the Bosch Varioperfect I have. Hunted everywhere through manual and on line. Hi Linda, you have active child lock on your washing machine. Push and hold Start button for few second. Child lock will switch off. Thanks for the advise about CL all sorted now!!! !